iPhone is a line of smartphones designed and marketed by Apple Inc. All generations of the iPhone use Apple's iOS mobile operating system software. The first-generation iPhone was released on June 29, 2007, and multiple updated hardware and new versions with new iOS releases have been released since. The user interface is built around the device's multi-touch screen, including a virtual keyboard. The iPhone has Wi-Fi and can connect to cellular networks. An iPhone can shoot video (though this was not a standard feature until the iPhone 3GS), take photos, play music, send and receive email, browse the web, send and receive text messages, follow GPS navigation, record notes, perform mathematical calculations, and receive visual voicemail. Other functionality, such as video games, reference works, and social networking, can be enabled by downloading mobile apps. As of 2017 Apple's App Store contained more than 2.2 million applications available for the iPhone. The original iPhone was described as "revolutionary" and a "game-changer" for the mobile phone industry. Future versions of the iPhone have also garnered praise. The iPhone is one of the most widely used smartphones in the world, and its success has been credited with helping Apple become one of the world's most valuable publicly traded companies. 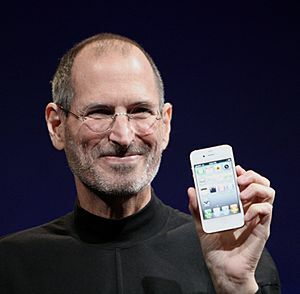 The iPhone attracts users of all ages, and besides consumer use, the iPhone has also been adopted for business purposes. Apple has released eleven generations of iPhone models, each accompanied by one of the eleven major releases of the iOS operating system. The original first-generation iPhone was a GSM phone. The iPhone 3G added 3G network support, and was followed by the 3GS with improved hardware, the 4 with a metal chassis, higher display resolution and front-facing camera, and the 4S with improved hardware and the voice assistant Siri. The iPhone 5 featured a taller, 4-inch display and Apple's newly introduced Lightning connector. In 2013, Apple released the 5S with improved hardware and a fingerprint reader, and the lower-cost 5C, a version of the 5 with colored plastic casings instead of metal. They were followed by the larger iPhone 6, with models featuring 4.7-and-5.5-inch (120 and 140 mm) displays. The iPhone 6S was introduced the following year, which featured hardware upgrades and support for pressure-sensitive touch inputs, as well as the SE—which featured hardware from the 6S but the smaller form factor of the 5S. 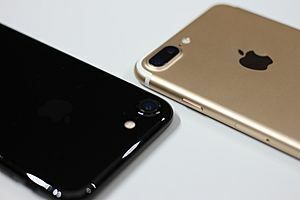 In 2016, Apple unveiled the iPhone 7 and 7 Plus, which added water resistance, improved system and graphics performance, a new rear dual-camera setup on the Plus model, and new color options, while removing the 3.5 mm headphone jack found on previous models. 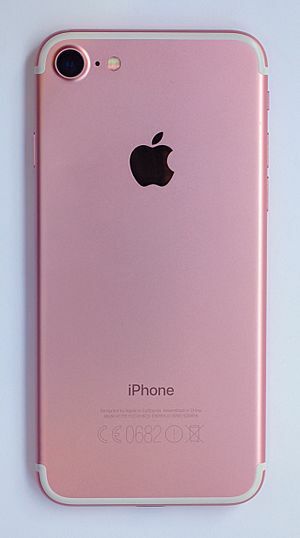 The iPhone 8 and 8 Plus were released in 2017, adding a glass back and an improved screen and camera. The iPhone X was released alongside the 8 and 8 Plus, an improved camera and a new facial recognition system, named Face ID, but having no home button, and therefore, no Touch ID. On September 12, 2018, Apple officially unveiled the iPhone XS, XS Max and XR at the Steve Jobs theater at Apple Park. The XS and XS Max feature an improved Super Retina Display with Dolby Vision and HDR10 support with the XS Max featuring a larger 6.5" display, improved cameras with Smart HDR, and the A12 Bionic chip. The iPhone XS and XS Max are IP68 water, liquid, and dust resistant which allow the devices to be submerged in up to 2 meters for a duration of 30 minutes. 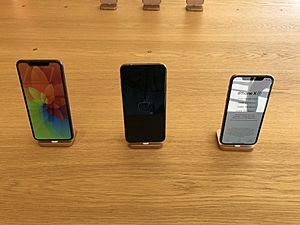 The iPhone XS/XS Max's IP68 certifications were tested using various liquids such as chlorinated-water, salt water, tea, wine, beer, and juices. Apple also announced the fourth generation of Apple Watch, the Apple Watch Series 4. 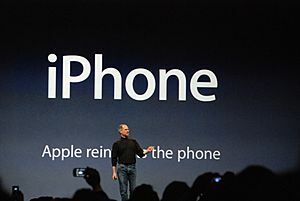 Jobs unveiled the iPhone to the public on January 9, 2007, at the Macworld 2007 convention at the Moscone Center in San Francisco. The two initial models, a 4 GB model priced at US$499 and an 8 GB model at US$599 (both requiring a two-year contract), went on sale in the United States on June 29, 2007, at 6:00 pm local time, while hundreds of customers lined up outside the stores nationwide. From 2007 to 2011, Apple spent $647 million on advertising for the iPhone in the US. Apple sent invitations for a press event to be held October 4, 2011, at 10:00 am at the Cupertino headquarters to announce details of the next generation iPhone, which turned out to be iPhone 4S. Over 1 million 4S models were sold in the first 24 hours after its release in October 2011. Due to large volumes of the iPhone being manufactured and its high selling price, Apple became the largest mobile handset vendor in the world by revenue, in 2011, surpassing long-time leader Nokia. On September 20, 2013, the sales date of the iPhone 5S and 5C models, the longest ever queue was observed at the New York City flagship Apple store, in addition to prominent queues in San Francisco, US and Canada; however, locations throughout the world were identified for the anticipation of corresponding consumers. 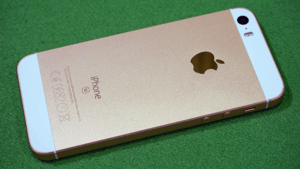 Apple also increased production of the gold-colored iPhone 5S due to the particularly strong demand that emerged. 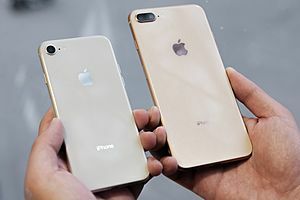 Apple had decided to introduce a gold model after finding that gold was seen as a popular sign of a luxury product among Chinese customers. Apple released its opening weekend sales results for the 5C and 5S models, showing an all-time high for the product's sales figures, with nine million handsets sold—the previous record was set in 2012, when five million handsets were sold during the opening weekend of the 5 model. This was the first time that Apple has simultaneously launched two models and the inclusion of China in the list of markets contributed to the record sales result. Apple also announced that, as of September 23, 2013 (2013 -09-23)[update], 200 million devices were running the iOS 7 update, making it the "fastest software upgrade in history." In January 2012, Apple reported its best quarterly earnings ever, with 53% of its revenue coming from the sale of 37 million iPhones, at an average selling price of nearly $660. The average selling price has remained fairly constant for most of the phone's lifespan, hovering between $622 and $660. Labor costs are estimated at between $12.50 and $30 per unit, with workers on the iPhone assembly line making $1.78 an hour. Up to the iPhone 4, all iPhone models, as well as other iOS devices were manufactured exclusively by Foxconn, based in Taiwan. 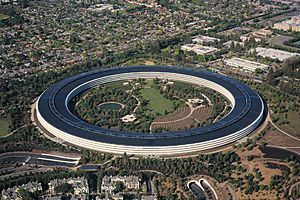 In 2011, after Tim Cook became CEO of the company, Apple changed its outsourcing strategy, for the first time increasing its supply partners. The iPhone 4s in 2012 was the first model which was manufactured simultaneously by two stand-alone companies: Foxconn as well as Pegatron, also based in Taiwan. Although Foxconn is still responsible for the larger share of production, Pegatron's orders have been slowly increased. 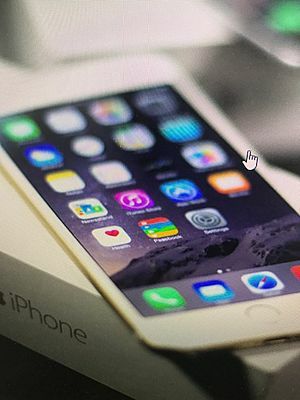 The touchscreen on the first five generations is a 9 cm (3.5 in) liquid crystal display with scratch-resistant glass, while the one on the iPhone 5 is four inches. The capacitive touchscreen is designed for a bare finger, or multiple fingers for multi-touch sensing. The iPhone X is the first iPhone to use an OLED display. It has a near bezel-less screen. The touch and gesture features of the iPhone are based on technology originally developed by FingerWorks. 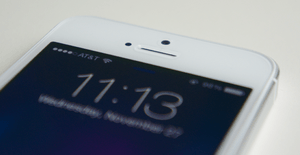 The iPhone has a minimal hardware user interface, with most models featuring five buttons. The only physical menu button is situated directly below the display, and is called the "Home button" because its primary function is to close the active app and navigates to the home screen of the interface. The iPhone X doesn't have a Home button but instead Face ID, a facial recognition authentication method. A multi-function sleep/wake button is located on the top of the device. It serves as the unit's power button, and also controls phone calls. 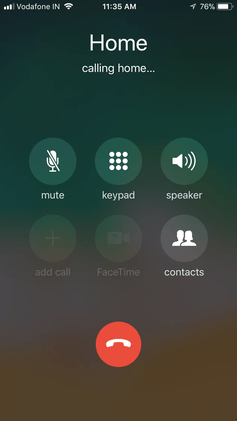 When a call is received, pressing the sleep/wake button once silences the ringtone, and when pressed twice transfers the call to voicemail. Situated on the left spine are the volume adjustment controls. 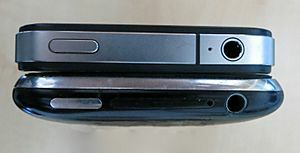 The iPhone 4 has two separate circular buttons to increase and decrease the volume. Directly above the volume controls is a ring/silent switch that when engaged mutes telephone ringing, alert sounds from new & sent emails, text messages, and other push notifications, camera shutter sounds, Voice Memo sound effects, phone lock/unlock sounds, keyboard clicks, and spoken auto-corrections. This switch does not mute alarm sounds from the Clock application, and in some countries or regions it will not mute the camera shutter or Voice Memo sound effects. All buttons except Home were made of plastic on the original first generation iPhone and metal on all later models. A 3-axis accelerometer senses the orientation of the phone and changes the screen accordingly, allowing the user to easily switch between portrait and landscape mode. Photo browsing, web browsing, and music playing support both upright and left or right widescreen orientations. It is also used for fitness tracking purposes. Cars equipped with an auxiliary jack allow hands free use of the iPhone while driving as a substitute for Bluetooth. The iPhone 7 and later have no 3.5mm headphone jack, and instead headsets must connect to the iPhone by Bluetooth. Apple's own headset has a multipurpose button near the microphone that can play or pause music, skip tracks, and answer or end phone calls without touching the iPhone. The built-in Bluetooth 2.x+EDR supports wireless earpieces and headphones, which requires the HSP profile. While non-sanctioned third-party solutions exist, the iPhone does not officially support the OBEX file transfer protocol. The lack of these profiles prevents iPhone users from exchanging multimedia files, such as pictures, music and videos, with other Bluetooth-enabled cell phones. The iPhone did not support voice recording until the 3.0 software update. 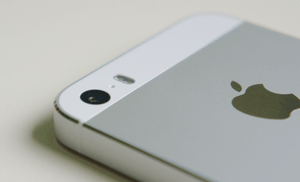 Apple runs tests on pre-production units to determine battery life. Apple's website says that the battery life "is designed to retain up to 80% of its original capacity after 400 full charge and discharge cycles", which is comparable to iPod batteries. If the battery malfunctions or dies prematurely, the phone can be returned to Apple and replaced for free while still under warranty. 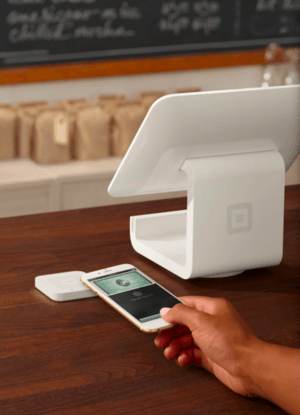 The warranty lasts one year from purchase and can be extended to two years with AppleCare. Apple reduced the price of an out-of-warranty iPhone battery replacement to $29. 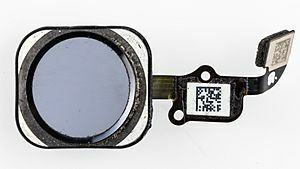 The first-generation iPhone and iPhone 3G have a fixed-focus 2.0-megapixel camera on the back for digital photos. It has no optical zoom, flash or autofocus, and does not support video recording. Video recording is possible on the first-generation iPhone and iPhone 3G via a third-party app available on the App Store or through jailbreaking. iPhone OS 2.0 introduced geotagging for photos. 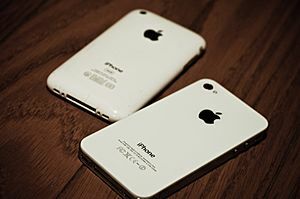 The iPhone 3GS has a 3.2-megapixel camera with auto focus, auto white balance, and auto macro (up to 10 cm). Manufactured by OmniVision, the camera can also capture 640×480 (VGA resolution) video at 30 frames per second. The video can be cropped on the iPhone and directly uploaded to YouTube or other services. The iPhone 4 introduced a 5.0-megapixel camera (2592×1936 pixels) that can record video at 720p resolution, considered high-definition. It also has a backside-illuminated sensor that can capture pictures in low light and an LED flash that can stay lit while recording video. It is the first iPhone that can do high dynamic range photography. The iPhone 4 also has a second camera on the front that can take VGA photos and record SD video. Saved recordings may be synced to the host computer, attached to email, or (where supported) sent by MMS. The iPhone was initially released with two options for internal storage size: 4 or 8 GB. 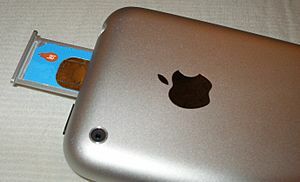 On September 5, 2007, Apple discontinued the 4 GB models. On February 5, 2008, Apple added a 16 GB model. The iPhone 4S was available in three sizes: 16, 32, and 64 GB. When the iPhone 7 and 7 Plus were released, Apple changed the base model storage capacity from 16 to 32 GB. Both the iPhone 7 and 7 Plus have configurations of 32, 128, and 256 GB storage. Apple doubled the storage on the iPhone 6S and 6S Plus in two configurations (32 and 128 GB), as well as the iPhone SE six months later. The iPhone 8, 8 Plus, and X have 64 or 256 GB of storage. In most countries, the iPhone is usually sold with a SIM lock, which prevents the iPhone from being used on a different mobile network. 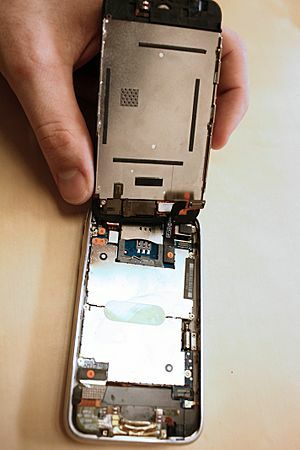 The GSM iPhone 4 features a MicroSIM card that is located in a slot on the right side of the device. The CDMA model of the iPhone 4, just the same as any other CDMA-only cell phone, does not use a SIM card or have a SIM card slot. 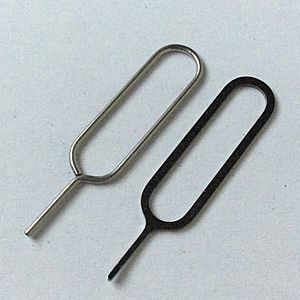 The iPhone 5 and later iPhones use nano-SIM in order to save space internally. All iPhone models include written documentation, and a dock connector to USB cable. All versions include a USB power adapter, or "wall charger", which allows the iPhone to charge from an AC outlet. The iPhone runs an operating system known as iOS (formerly iPhone OS). It is a variant of the Darwin operating system core found in macOS. Also included is the "Core Animation" software component from Mac OS X v10.5 Leopard. Together with the PowerVR hardware, it is responsible for the interface's motion graphics. The iPhone comes with a set of bundled applications developed by Apple, and supports downloading third-party applications through the App Store. IPhone Facts for Kids. Kiddle Encyclopedia.